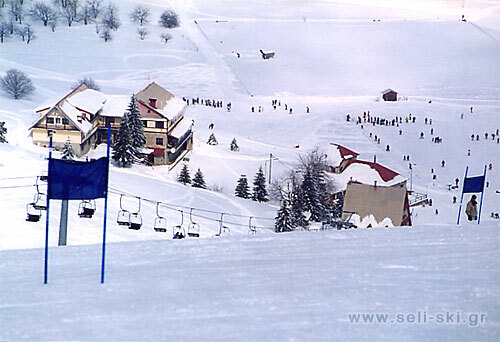 Seli National Ski Center is in the south-western side of Vermio. 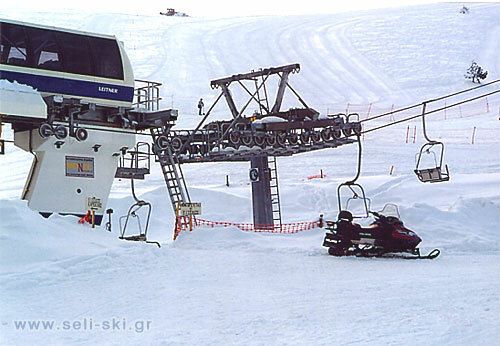 Altitude difference: Minimum: 160 m Maximum: 370 m.
1 double seat aerial chair lift, Filippos, constructed in 2002, 1600 m in length with a capability of 1200 persons/hour - Starting point at 1520 m and peak point at 1620 m (Arssoubasi site). Alexandros 1, constructed in 2007, 1150 m in length and with a capability of 900 persons/hour - Starting point at 1530 m and peak point at 1790 m.
Alexandros 2, constructed in 2007, 1150 m in length and with a capability of 900 persons/hour -Starting point at 1530 m and peak point at 1790 m.
Dias, constructed in 2000, 800 m in length and with a capability of 900 persons/hour - Starting point at 1650 m and peak point at 1890 m.
Hercules, constructed in 2000, 800 m in length and with a capability of 900 persons/hour - Starting point at 1650 m and peak point at 1890 m.
Ares, constructed in 2000, 840 m in length and with a capability of 900 persons/hour - Starting point at 1650 m and peak point at 1830 m.
Amyntas, constructed in 2002, 700 m in length and with a capability of 500/persons/hour - Starting point at 1650 m and peak point at 1780 m.
Iason (Rope), 120 m in length and with a capability of 250 persons/hour - Starting point at 1500 m and peak point at 1510 m.
Orfeus, 150 m in length and with a capability of 300 persons/hour - Starting point at 1500 m and peak point at 1530 m..
Hermes, 100 m in length and with a capability of 300 persons/hour - Starting point at 1650 m and peak point at 1660 m.
Veris, 120 m in length - Starting point at 1500 m and peak point at 1530 m.
The Shelter of Veria Ski and Alpine Club, with a capacity of 120 beds, heated, with hot water, gym-sauna, restaurant and cafe-bar. The Shelter of Thessaloniki Alpine Club, with a capacity of 70 beds, heated, with hot water, restaurant, cafe-bar. Private guesthouse (Platitsas Chalet), with a capacity of 10 beds and cafe-bar. Restaurant-cafe-bar (DIOGENIS), property of Seli National Ski Center. Chalet, at the peak of the Ski Center (altitude 1750 m), property of Seli National Ski Center in which a cafe-bar operates. 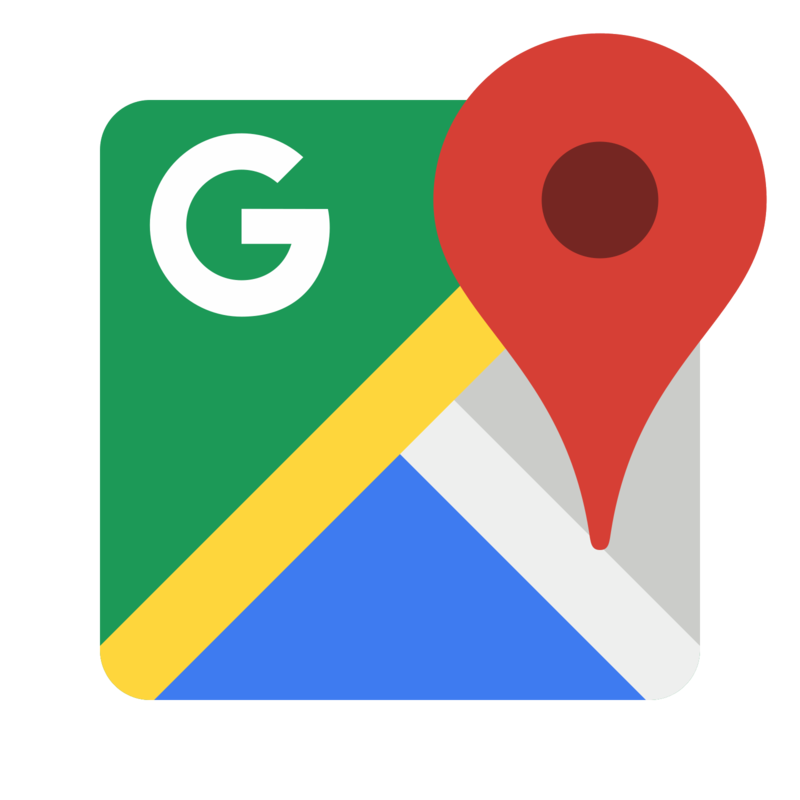 Organized ski schools (ski equipment market, etc.) - These schools are private and function daily. Health center, fully medically and pharmaceutically equipped and staffed with specialized nurse and doctor, as well as a doctor in charge during weekends and Holidays for first aid to skiers. It is also equipped with an ambulance in collaboration with the National Instand Aid Centre (E.K.A.V.) for the fast transportation of the injured people. Trailers: The Seli National Ski Center accepts the visit and accommodation of trailers. Indeed, the relationship that has been developed between the Center and "Trailers’ Owners" is so warm and steady, that the owners have founded a naturalist association under the title "Zeus" ideal for coordinated improvement claims. The full operation, responsibility and management for the stay of trailers belongs to the Ski Center and there is always room for improvement to their benefit, in order to provide the most enjoyable stay to these particular visitors. The center can accommodate up to 40-50 parked trailers throughout the winter. For more information you can contact the familiar telephone numbers. The access roads are always open during winter. 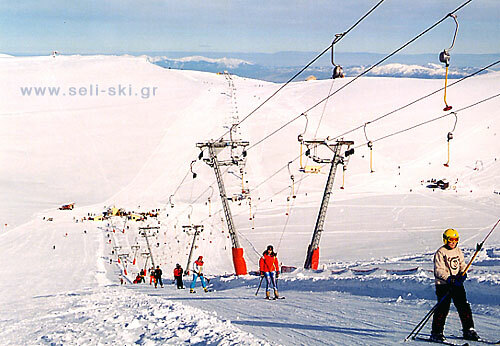 The Seli National Ski Center stands within easy range of communication with many regional centers of North Greece. 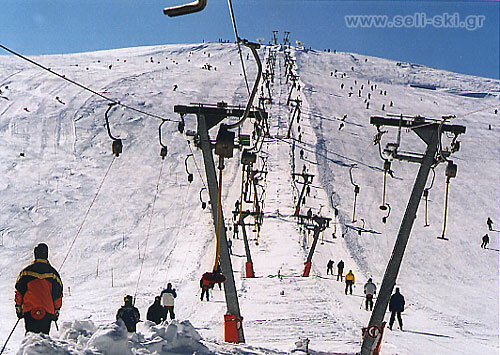 The main access to the Ski Center is via the Egnatia motorway and country road Veria - Seli. Eternal access is via the provincial road Naoussa - Seli. 4 snow-skids for the slopes daily formation and coating (3 Prinoth T4 250 PH & 1 Prinoth T3 170 PH). 3 snowploughs for the fast cleaning of the road access Seli Ski Center- Seli village-Veria, as well as for the cleaning of parking of the ski center. 2 snowmobiles for the fast transportation of the ski center employees to the slopes and lifts. Seli National Ski Center facilities operate from October to April, daily from 9 a.m. to 4.30 p.m., with a possibility of time extension. 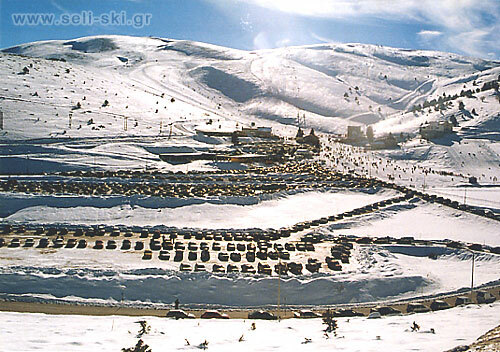 The Seli National Ski Center began operations in 1934, which was the year that the first Panhellenic Games were organized and it is also the first organized ski center of the country. The first lift of the country was placed here in 1955 (aerial chair of 750 m long) that reached an altitude of 1600 m, and in 1968 was extended by 500 m in length, reaching an altitude of 1730 m.
On 4.2.1972 a Royal Decree designated it as national stage under the name "National Seli Ski Center". It is a Legal Entity of Public Law and it belongs to the General Secretariat of Sports. World Endurance Criterion Way of Alpine & Non-Alpine Countries and Athletes of Cities took place here in the 1980s and it was characterized by consensus of the participants and representatives of the International Ski Federation as "Small Olympic Games" and the best organization in the history of the institution. A 7-member committee, whose tenure is two years, manages the Seli National Ski Center. 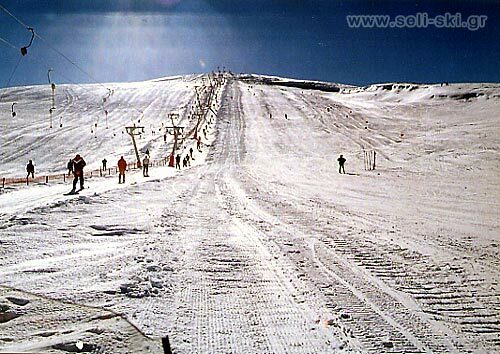 It is considered as the first cell of the athletic and touristic skiing. Seli National Ski Center offers a wide variety of track fields for tourist and race skiing, playgrounds, long distance race paths. It can also hold international matches as it gives thousand of skiers the chance to exercise without limits. The E4 European long distance path passes through there and it has many hiking trails. The excellent snow conditions, the amazing sunshine and low humidity give pleasure to visitors. In Seli or Kato Vermio village, 1.5 km away from Seli National Ski Center there is a variety of traditional lodgements, restaurants & coffee bars that can make your stay more pleasant, in a combination of tradition & Greek countryside. Similar type facilities are also on the road to Naoussa. a visit to the monastery of the Virgin of Soumela.